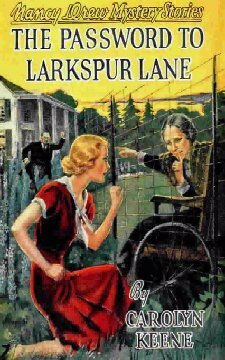 Published in 1933, The Password to Larkspur Lane is the tenth book in the original Nancy Drew series, and the third and final book written by ghostwriter Walter Karig. When Nancy's housekeeper, Hannah, takes a fall, Nancy takes her to see the local physician, Dr. Spires, who has just been involved in something very unusual. Strangers blindfolded him, and dragged him into their car, then drove him to an unfamiliar location where they had him treat an elderly woman's injury. After treating the woman, as he was taken from this unknown place, Spires snatched the woman's bracelet in the hopes that he would be able to find out who she is and whether she is in danger. Dr. Spires, knowing that Nancy has a reputation as a good sleuth, and a father also known for helping people out of difficult situations, gives the bracelet to Nancy and asks her to investigate. As Nancy follows the clues with the help of her friend Helen Corning, it becomes clear that there is something sinister happening at a nearby nursing home which endangers not only many elderly patients, but also those, like Nancy, who want to uncover the truth. Still, despite Nancy's irritating perfection, this is a solid mystery story and I was definitely invested in finding out what was happening and how Nancy would bring the evildoers to justice. I can't imagine a children's book about a mystery involving a nursing home being published today, which just makes me appreciate the charm of this vintage book that much more. Also charming are the references to the culture and style of the 1930s: roadsters, rumble seats, sanatoriums, frocks, a yacht club dance, etc. I didn't notice as much slang in this book as I found in the 1927 Hardy Boys book I read last year, but there is still an old-fashioned sensibility to the book that was enjoyable. I'm not in a big hurry to read another Nancy Drew book, but this was a fun little cozy mystery to ease into the new year, and much better than any of the modern-day Nancy Drew books. Hi I checked this book amazing , thanks and I can suggest to you The Lost Ways book, I think its very good.